Fall and spring are the best times to fish for spotted sea trout in Florida, and our Big Bend coastline from Yankeetown to Panacea has some of the best trout flats in the state. We don’t have just a few fishy spots like other places, but miles and miles of pristine, unspoiled coastline with vast stretches of the grassy bottom that this popular species of fish just love. Any fisherman who’s visited the Natural North Florida Gulf coastline will tell you that there’s no place better to fish for these tasty critters. 2010 was an excellent ‘weather year’ with no major storms or hurricanes to mess up the fishing here. Now, after an excellent summertime bay scalloping season, the water’s cooled off and trout fishing has become the major fishing event at towns like Suwannee, Horseshoe Beach, Steinhatchee, Keaton Beach, and St. Marks (And of course, Yankeetown and Panacea, listed above!). 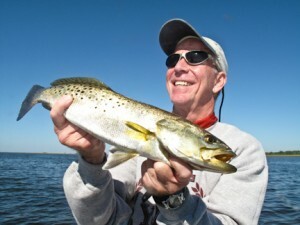 Each of these out-of-the-way Natural North Florida towns has numerous opportunities for the visiting angler, whether he plans to bring his own boat or charter a local guide. For up-to-the-minute Big Bend and Northwest Florida fishing advice and reports, check out Florida Sportsman Magazine’s Fishing4Casts, updated weekly every Thursday afternoon.